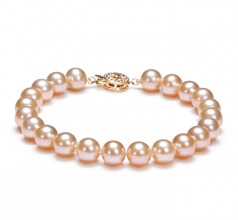 Soft and delicate in colour, this Pink Freshwater Pearl Bracelet makes a classic and timeless fashion statement without the pomp and fuss of the more vibrant colours. 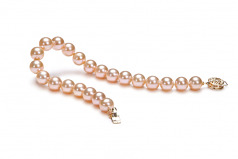 The gentle reminders of its overall (AAAA) lustre can be seen across a room full of people as the sparkling power of perfect pearls give way to a magnificent show of silent fireworks. It is the display of a captive and perfected Pink 7-8mm AAAA Quality Freshwater Pearl Bracelet that is held together with a beautiful clasp.